What is selling stock photography? Stock photography (also called microstock or micropayment photography) generally refers to images that are uploaded to an agency. They can be added to a photo library for others to purchase. The photographer makes a commission per sale. This can be anything between 25 cents and five dollars, or more, depending on the agency. Stock photography is normally in reference to selling images on your own website or larger paying agencies such as Getty Images or Alamy. Microstock or micropayment photography are subscription based agencies such as Shutterstock, Dreamstime, or Istockphoto. The photographer will receive a smaller profit over a longer time. 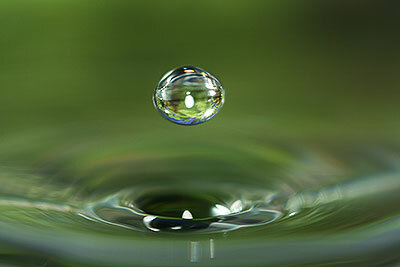 For example, I’ve made several hundred dollars from this photo of a water droplet shown below through Getty Images. They saw it on my flickr account and requested the image for their clientele and has now sold several times. Each sale giving myself anywhere between $60 and $150 profit each time. Keep in mind their clientele are normally magazine publishers and those willing to pay a higher price for republishing your images. Sales from these types of agencies are often few and far between, but when they do happen they pay well. Now lets look at an example of an image that sells well across all microstock agencies. 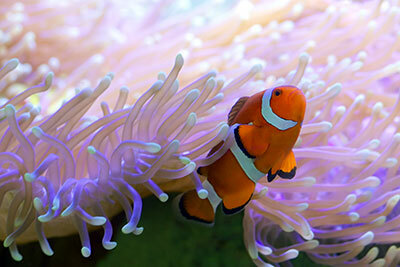 Little Nemo (photographed in an aquarium), is a popular image selling almost daily on one microstock site or another. The difference being, with microstock agencies the photographer usually only makes between thirty cents to five dollars per sale. Buyers are offered subscriptions allowing them to download many images per month for very little cost. When someone from a microstock subscription makes a purchase, the photographer usually gets as little as 25 cents (depending on other factors). However, these sales happen more often. As the photographer you reap the benefit over a longer period of time. At this stage you are thinking gees that’s not very much money! At first this may not seem like a lot. However it’s important to keep in mind that a single photograph could possible sell thousands of times over, making you a very neat profit. Imagine getting 25 cents every time you press your cameras shutter button! Reading forums and photography blogs, there seems to be a lot of negativity recently when it comes to stock photography. Photographers aren’t getting as much profits as they were several years ago. So your next question might be, is stock photography still worth it or how much money do you make from stock photography? In my personal opinion it is definitely still worth your time and effort. Lets face it, how many images do you have sitting on a hard drive somewhere that no one looks at? Why not have them sitting on several stock sites with the potential of earning you extra residual income. I can tell you now, residual income is awesome! You upload the images once and reap the rewards for years. How many images do you have sitting on free photo galleries like flickr or 500px? Why not upload them to microstock websites instead and earn extra income. In my experience microstock communities are just as fun and friendly as flickr and 500px if you enjoy the social aspect of mixing with other photographers. I find this especially true with Dreamstime community. If you are new to stock photography you won’t be comparing profits with those from several years ago. You’ll be comparing them with going from zero dollars to a couple of hundred dollars or more per month across a dozen stock sites. If you have one thousand images on eight to twelve of the top microstock agencies you’ll make roughly $500 per month. $6000 extra income per year for me means a new camera. Perhaps a few professional lenses, or a high quality photo printer with a years supply of inks and fine art papers. That sure beats uploading them to free photo galleries! This image above is a great example of a photo that sat on my hard drive for years and now sells every few days. It was an image I’d forgotten about until looking through old photographs a few month ago. 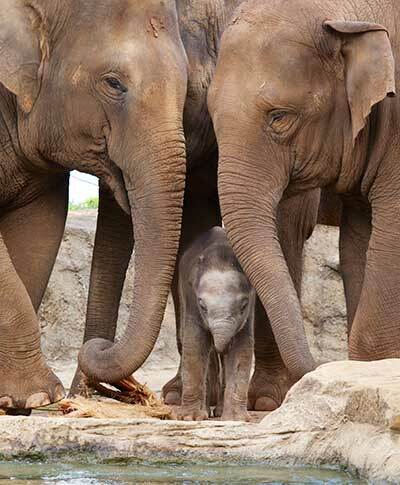 I also have several other images selling well from the same trip to the zoo. Stock photography doesn’t necessarily mean professional shots set up with white backgrounds. Often the best sellers are those you shoot in every day activities. After submitting photographs to twelve different stock agencies, this is what I’ve learned so far about selling microstock. Submit your photographs to more than one stock agency. There is no reason to limit yourself to only one microstock site. They all have different customer bases who will be searching similar keywords. I find if an image sells well in one agency, it will also sell well in another. Imagine the sales I’d have lost if I limited myself to only one microstock site. Photographs that are rejected by one agency, can be accepted and sold well by another. It doesn’t take long to realize what each agency likes and doesn’t like. There are many reasons why an agency may reject an image. Just because an agency rejected your photo, doesn’t mean it was a bad image. Most agencies will give an explanation for the rejection. However don’t take this personally or become disheartened. A good example of rejection is the water drop seen at the start of this page. It sells well on Getty Images for a high price, yet microstock sites like Dreamstime or Shutterstock, rejected the image when submitted. One said the image wasn’t focussed enough on the droplet. The other agency said they already had enough of that specific subject in their database. As a photographer you can also learn a great deal from rejections. 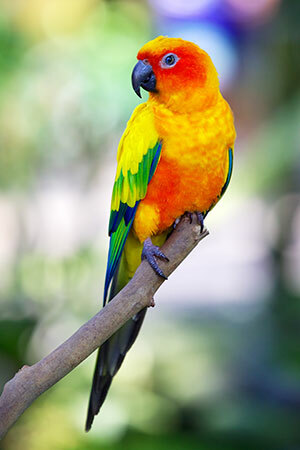 For example, this image of a bird below was rejected by a couple of agencies who all gave the same reason. Looking at the photo in a smaller size it looks perfectly focussed and sharp. However, when viewing the bird photo in it’s full resolution it’s clear to see the eye is hazy and the focus is on the birds body, not its eye. Lesson being, eyes need to be in sharp focus. I also learned that I should view photos in their full resolution before submitting them. If you have any doubt about sharpness seen in the photo, I suggest resizing the image to the lowest resolution accepted by the microstock agency. In other words, don’t submit the full resolution. Minimizing file sizes also increases sharpness. I’ve had images that were initially rejected due to sharpness, I resized them to smaller resolutions and then successfully resubmitted. Check your photographs in their full size for noise. Noise refers to grainy or pixilated area’s found within some photos. Any images that contain noise are usually rejected by stock agencies. The best way to stop noise from appearing within your photographs, is to set your digital SLR camera to its lowest ISO. However, sometimes this is not possible depending on the lighting situation. So how do you get grainy photos accepted by stock agencies? First you need to minimize the grain by using software such as Define http://www.niksoftware.com/nikcollection/usa/dfine.html which is part of the Nik collection. There are many other similar software available. If you own Photoshop you can also use the blur tool to rub over grainy areas which minimizes the chance of stock agencies rejecting the image. As with sharpness, resizing images to a smaller size also helps with noise reduction seen in the photo. If you are submitting insect or flower images, use their scientific name as well when adding keywords to help increase sales. Don’t crop photographs too tight (if at all) so there is some space for buyers to add text if needed. Often publishers who purchase your images, will want to use them for posters or full page advertising. Therefore, they need space for words and quotes. I’ve found images with space, are more easily accepted by stock agencies and sell better than those cropped tightly. Don’t upload too many photographs of the same theme, otherwise they may be rejected. For example, just because an agency has accepted one of your high rise buildings, it doesn’t mean they want another seven from different angles. Most agencies have enough photographs of flowers and pets. It’s always best to check out their list of ‘wants’ and ‘don’t wants’. Each agency will differ in the types of photo’s they need and don’t need. The more photographs you submit, the more money you make. Those that submit 400 photographs, make more money than those who submit 50. If you intend on making a living from stock photography, then you should be treating it like a full time job. To date, this is a list of the most profitable microstock agencies from my personal experience. They are also the four best microstock agencies I recommend starting with submitting your images to and the reasons why. Dreamstime pays out one of the highest royalties of all microstock agencies per image. This changes depending on the size of the photo that is downloaded. However I find many buyers in Dreamstime are not necessarily subscription buyers and I regularly receive five dollars for a purchase. They are also the easiest to get accepted into and have a very friendly community amongst photographers. Dreamstime accepts JPG images in 3MP (million pixels) size or larger. They currently pay royalties via bank check, Paypal or Moneybookers. So far, Dreamstime is a personal favorite. I have a high photo acceptance rate and better royalties per sale than any other stock agency. The payout rate for Shutterstock is currently 25 cents per sale for subscription downloads. This is one of the lowest royalties, however they do have a huge following and small change can add up over a year. Shutterstock is one of the largest and well known microstock agencies, which also means more sales per image. Many photographers including myself will tell you that the majority of their stock photography profits come from Shutterstock. I receive a dozen daily sales per 150 images I upload. It could take a long time to be initially accepted by Shutterstock, as you need to submit 10 of your best photos. If 7 out of 10 are accepted then you’re in. If not, you need to wait a whole month before you try again. All I can say is, don’t give up! Shutterstock is worth persisting with. It took me three tries before I was accepted. I learned much along the way and now have a high submission acceptance of images with hundreds of sales per month. They accept JPG images at 4MP (million pixels) size or larger. I won’t go into many details here as they already have a fantastic training manual with photo requirements, cropping and composition tips etc. All I can say is that IStockphoto is definitely one to try. Like Shutterstock, they are also a very popular microstock agency that has a lot of website traffic. As the photographer you’ll make 50 cents to three dollars per download. There is an online test you need to pass before being accepted into their program. However, you can do it as many times as needed. Once your in, you’ll get a high percentage of photos accepted. BigStockPhoto rejects very few images so is great for beginners. I recommend starting with these four microstock agencies to begin with, then when you have 200 photographs accepted, add another four to six agencies to the list.